Get rewarded for your shopping with our Rewards promotion! 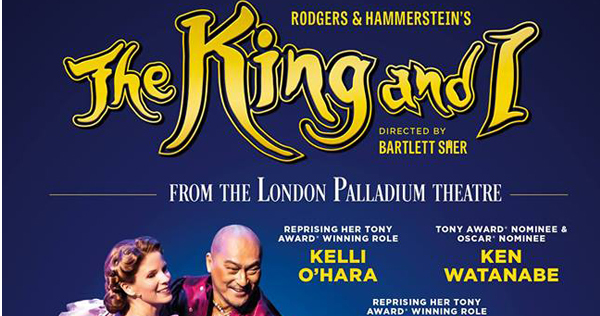 Now nominated for 6 Olivier Awards, The King and I returns to Parkway Cinema as they bring the best of the West End to Beverley. The Easter bunnies have escaped and are hiding in the windows at Flemingate. We need your help to find them! 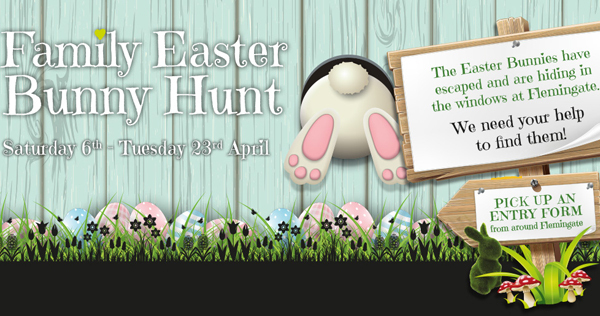 Look in the windows around Flemingate and write down the name of the bunnies you find for your chance to win a great prize from The Entertainer. Once you’ve found them all, please post your entry in the postbox at THECREATIVELAB. 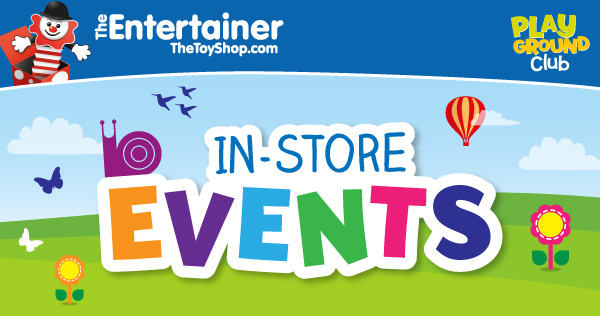 Every Saturday, The Entertainer at Flemingate will be demonstrating exciting new toys. You get to see how they work and have a go! Every Monday. 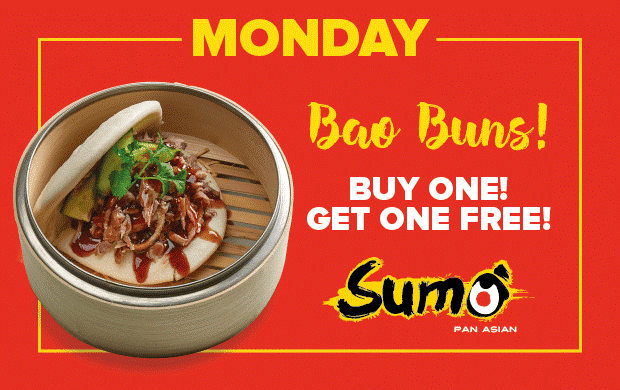 Buy one, get one free on Bao Buns at Sumo! Flemingate is located only a short 1 minute walk from Beverley Minster. Simply head east on Minster Yard North toward Eastgate before taking a right. Continue walking straight on to Flemingate and you are ready to shop. Follow the A1079 directly from Hull to Beverley town centre and arrive at Flemingate in just 15 minutes. Flemingate is one hour from Leeds and is easily accessible from the M62. Leaving at Junction 38 of the M62 you will travel 12 miles on A roads directly to Flemingate. Located 45 minutes from York, follow the A1079 directly to Beverley town centre. Situated 30 minutes from Driffield, follow the A164 to Beverley town centre. From Bridlington, follow the A165. An estimated journey of 1 hour, follow the B1249 and A164 from Scarborough to Beverley. In addition to the existing Service 246, operating between Hornsea and Beverley, the route for Service X80 gives residents of Hessle, Anlaby, Willerby and Cottingham an easy way to get to Flemingate. For timetables and further information, visit the website. Beverley has an active cycling community, offering extensive cycle parking facilities which are located throughout the town. Click here to view cycling maps which are available to download from the transport policy section. Coming for a flying visit? The nearest airports are Humberside, Doncaster Sheffield and Leeds Bradford. Park with ease at our impressive 500-space multi-storey car, located within easy reach of the centre. Disabled and child-friendly parking bays also available. The car park is open 24/7, Height Restriction – 2.1 metres. Meet and greet service with ‘free’ 7 day secure parking. Overnight parking available on request. Pre-booking facility for Coffee, Lunch, Dinner or the Cinema. Passenger welcome bag includes a guide to Beverley and Map. Don’t let limited mobility stop you, a friend or family member from enjoying all that Flemingate and Beverley have to offer. In conjunction with ‘Fox Mobility’ of Beverley you can book a motorised scooter for a whole day for just £10 and make the most of our mobility-friendly location. Manual wheelchairs are also for hire at £10 per day (subject to availability) but unfortunately they cannot be reserved. To hire a mobility vehicle, all we need from you is proof of identification which should be either a valid passport, valid driver’s license or a utility bill dated within the last three months. On presentation of these, you’ll be asked to fill out a hire agreement form. Once that’s done, you’re ready to go! The whole process takes less than 30 minutes (including training on how to use the vehicle if it’s your first time). The Scooter can be hired from the Car Park office, near the entrance to the car park, where the vehicle height is below 2.1m high. Just ring the Flemingate Office number (01482 867 024) during the office hours of 08:00 – 16:00 Monday to Friday to make your booking and arrange the time to be met. For a huge range of hardware, homeware and garden products. Money-off vouchers & offers plus updates on exciting events & competitions.